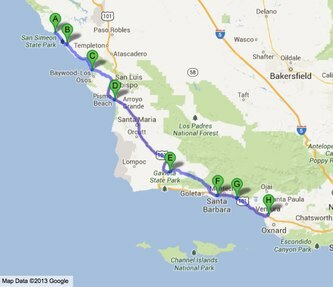 If you stayed at one of the hotels at Santa Barbara’s beach, the fastest way to the HWY is over Cabrillo Blvd. The first ramp is to the left of Cabrillo Blvd at Garden Street. The second ramp is located further south at South Milpas Street (to your left). Just follow the street until Alisos Street, make a right and continue up to the ramp. If you stayed in Carpinteria you only have to take Reynolds Ave to the north (1st left, after turning left leaving the hotel driveway). Those, who stayed at Motel 6, take Casitas Pass Road to the north past the shopping arcade. The ramp is to the right infront the highway bridge. Behind Ventura follows the town of Oxnard from where you are able to enter Pacific Coast Highway. The easiest route goes over HWY 101 exit N Rice Avenue. Follow the road to its end and the beginning of Pacific Coast Highway (PCH). Behind the naval base in Oxnard the road slowly winds towards the coastline and Malibu. On your way you are passing several beaches including scenic Point Mugu and its beach. Further south follows Neptune’s Net, a fish restaurant to your left. You might recognize it from the movie “Point Break” starring Patrick Swayze and Keanu Reeves. If you are hungry don’t hesitate to stop here, since the food is pretty good. Otherwise there are some other good restaurants in Malibu lying ahead of you. 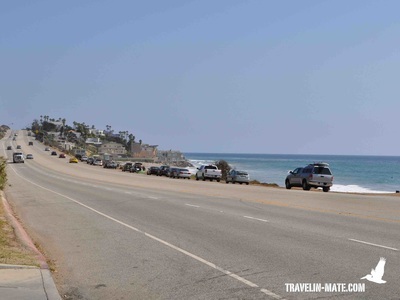 Most people think of Malibu as a classic beach town with a city center. This is not really the case. The town spreads over 21 miles (about 34km) along the coast. 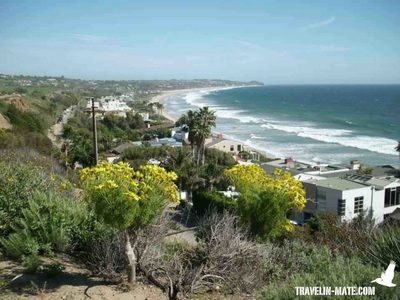 Malibu is in particular known for long and sandy beaches and the celebs that are living here. To keep their privacy, they love to block the beach areas in front of their properties with fences and ‘no trespassing’ signs or even hire security to block the access. However, all these signs, fences, and staff are illegal. The whole beach area of Malibu is open to the public and it’s not forbidden to trespass any area. So don’t let yourself be fooled by warnings as long as you stay at the beach to enjoy the view and its pompous homes. Amongst the most beautiful beaches in Malibu are Mugu, Broad, Esconido und Lechuza Beach. 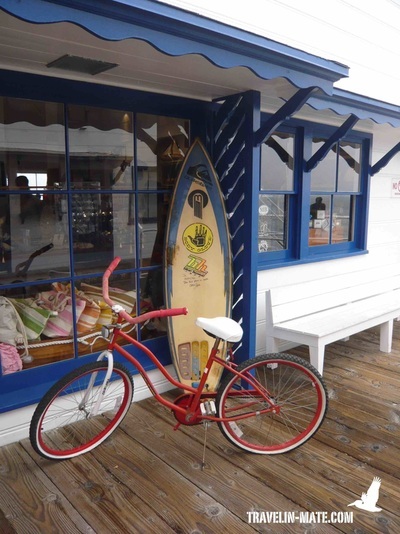 East of the PCH, behind Pepperdine University, along Civic Center Way you will find two fancy outdoor shopping malls, the Lumber Yard and Malibu Country Mart. Both offer plenty of shops, plus large greens and courtyards with lounge furniture if you need a rest. A bit further south between Sierra Road and Sweetwater Canyon Drive is the Malibu Pier to your right. It was renovated and re-opened for public recently. The Surfrider Beach adjoins it, and as the name implies it is a popular surf spot. If you want to try out surfing in L.A. and its vicinities you should give it a try at Surfrider Beach. In contrary to Santa Cruz the water is warm and the best choice for beginners in the L.A. area. The Malibu Surf Shack on the opposite of the street offers lessons and rents boards for more experienced surfers. Continuing the drive towards Santa Monica you are passing the Getty Villa to your left behind Coastline Drive at Pacific Palisades. The PCH leads you directly to Santa Monica. Instead of merging onto HWY 10 exit at Ocean Ave. The exit ramp is parallel to Santa Monica Pier. From Ocean Ave you easily can access the beach, boardwalk and the pier’s parking lots. Furthermore most hotels are located between Ocean Ave and 4th Street. 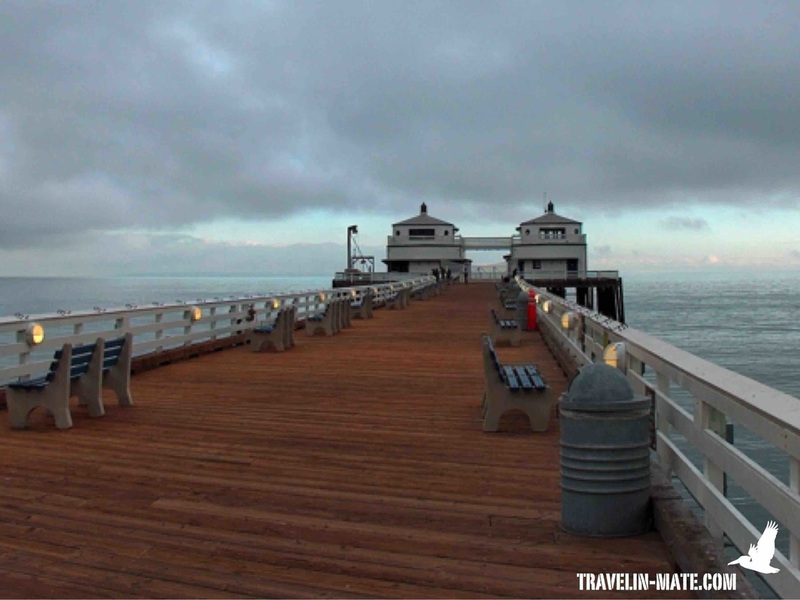 Spend the evening with a walk along the beach or the Palisades Park above the PCH and pay the pier a visit. At night the ferry wheel and other attractions will be illuminated. 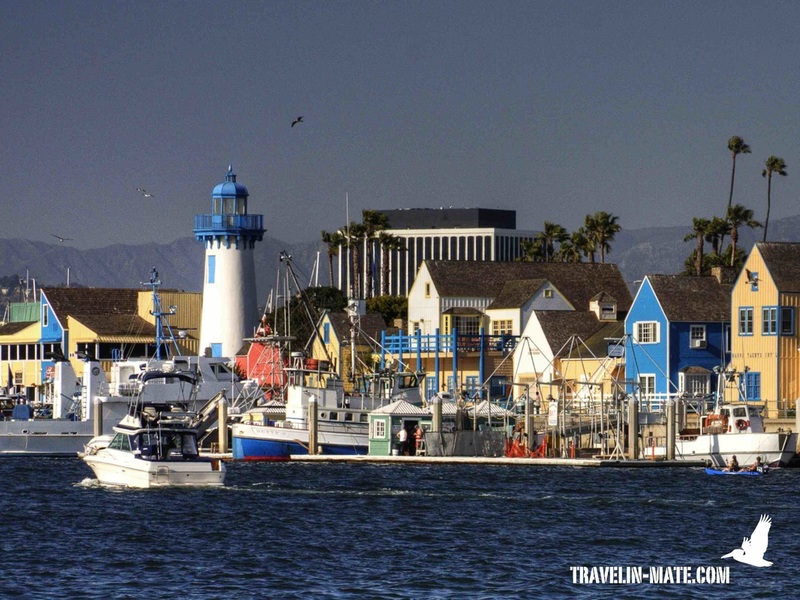 If you are planning to walk down to Venice and Marina del Rey with its harbor you will cover a distance 4.1 miles (3.1 miles until the Fishing Pier) per direction. If you are not in the mood for the whole distance, shorten or postpone the walk or rent a bike at one of the many bike rentals, e.g. at Bangs Bike Rental, 1925 Main Street, Santa Monica. The walk mainly leads you along the promenade and marvelous endless beaches. 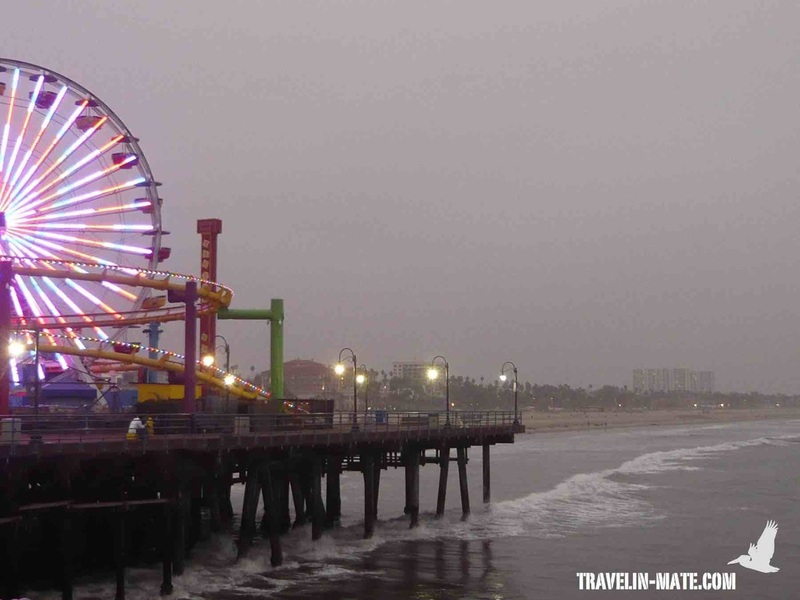 The beach section in Santa Monica is sophisticated, quiet and relaxed and popular with people who are working out. Venice on the other hand is more artistic and loud. You will see street performers that are showing their skills and artists who are selling their crafts. The stores in this section offer tons of knick-knack but also stylish beach wear for little money. To get away from the hustle and bustle head to the beach. It is astonishing how quiet it gets as soon as you are stepping off the boardwalk. Without Abbott Kinney Venice probably wouldn’t be here. 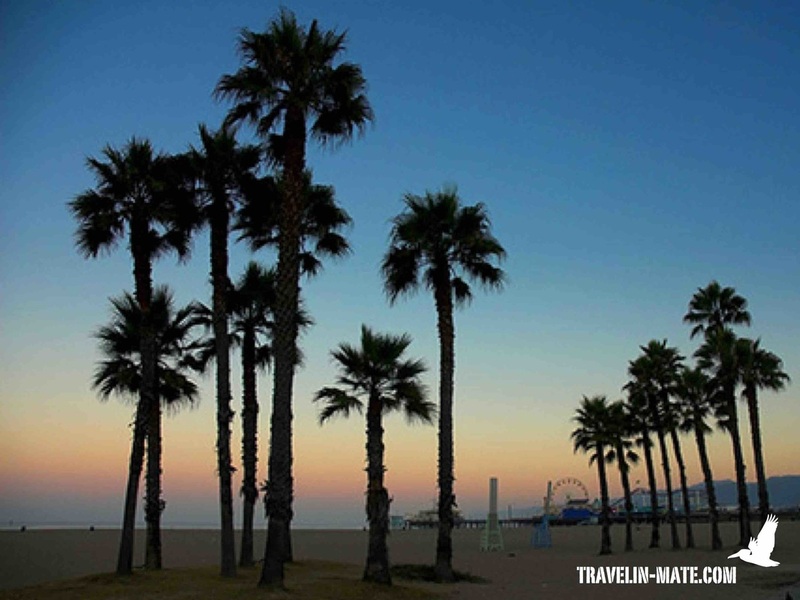 He founded a beach resort called Ocean Park in 1905, the first step for the neighborhood that later was called Venice. The tabacco mogul’s resort was based on Venice in Italy and contained canals, brigdes, gondolas and train rides to entertain the visitors. With the resort Venice started to grow and was embedded into L.A. in 1925. At the same time the resort was facing hygenical problems and high maintance costs due to incorrect plannings of the canal sewer system. Finally L.A. decided to fill up almost all canals to turn them into streets. This decision and modification was the end for the resort. 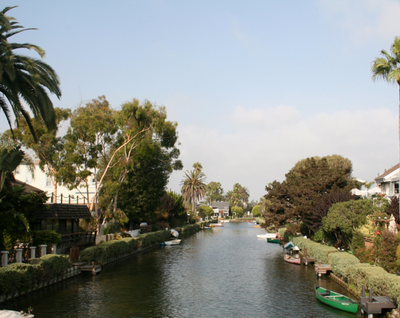 Nowadays only a small part of the neighborhood is still present with its original canals and wooden bridges. In particular Dell Avenue is well preserved and will be mentioned in detail later. 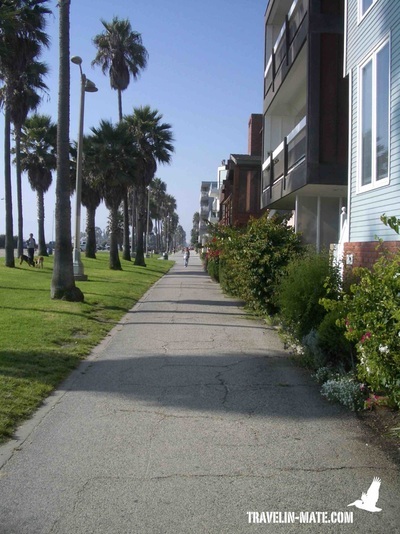 Behind Venice Bvld the stores fade out and the busy boardwalk transforms into a quiet residential area. Further down the street you will pass outlandish beach homes before you approach Venice Pier and later the harbor of Marina Del Rey with many sailing boats and yachts. 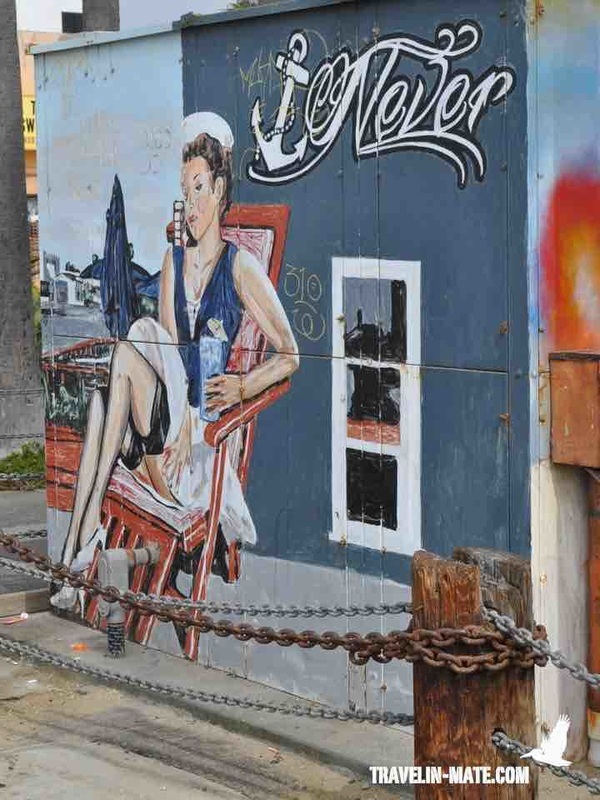 If you are hungry keep your eyes open around Venice Pier and along Washington Blvd. Here you have many small restaurants and coffee shops with nice outside patios, from which you have an ocean view. Another restaurant area is Marina Del Rey’s yacht harbor. The Cheesecake Factory at Marquesas Way and Via Marina has an outside patio that is facing the harbor. 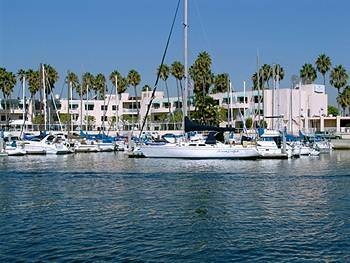 Marina Del Rey’s sailingboat and yacht harbor was built from 1953 - 1965 but was already planned in 1888. Its construction failed before, because the original investor’ went bankrupt and negative profit expectations had the city of L.A. postpone the construction. At the harbors northern end you have the Fisherman’s Village, a shopping promenade at the waterfront. The village even has its own lighthouse and might look famililar since it was the shooting location for several TV shows, including “The O. C”. Its style is based on East Coast harbor towns and it offers restaurants, coffee shops, a Catalina Island ferry terminal, plus bike and boat rentals. Heading back to Santa Monica you should stroll along the previous mentioned Dell Avenue, which goes off to the left from Washington Blvd. As mentioned before the street was part of a Venice styled beach resort built by Abbott Kinney at the beginning of the 20th century. The neighborhood was packed with canals, bridges and gondolas that framed quaint townhouses. Unfortunately, the project was designed incorrectly with the result that due to the ignored tides garbage was smutching the canals over the time followed by huge efforts keeping them clean. In 1925 after Venice became a part of L.A., the city decided to save costs by filling up the canals and turn them into streets. Dell Avenue was not affected by the changes and the canals and wooden bridges along the area are still well preserved. Leaving the area around Dell Avenue I recommend to head down Abbott Kinney Boulevard towards Main Street. The boulevard is the shopping and restaurant center of Venice. Alternatively you could return over the beach promenade to Santa Monica. If you are up for a drink with a panoramic view don’t hesitate and make a stop at Hotel Erwin on your way to the beach (17th Ave and Pacific Ave). The hotel’s High Bar and Lounge is located on the rooftop and offers comfy furniture and great views over Venice, Muscle Beach, Santa Monica and Downtown L.A.
From the beach make a left into Rose Avenue or follow Abbott Kinney Boulevard up to Main Street. Main Street is one of Santa Monica’s shopping and food miles. At its end you reach the Santa Monica Place Shopping Center and Third Street Promenade the other shopping paradise in the city. Third Street Promenade is closed for traffic since 1960. Here you have several stores and chains, movie theatres and street perfomers and tons of people enjoying them. Moreover it is the venue for the local farmer’s market that takes place every Wednesday and Saturday until noon. Since 20 years farmers are selling their organic veggies, fruits and other products to tourists and residents along the promenade. At one point the Third Street Promenade is crossing the historic Route 66, which starts in Chicago and ends just a few blocks from you at the beginning of Santa Monica Pier. If you haven’t had the chance to visit Santa Monica Pier yet, walk down Route 66 to the left. At the end you enter the very touristy and packed pier. The oldest attraction is the Looff Hippodrome, a horse carousel built in 1916 and since then kept in shape with periodically renovations. The pier was opened in 1909 and was a huge competition for the former Ocean Park in Venice since it offered modern and more exciting attractions. Nowadays chain restaurants and souvenir shops took over the former venues but the pier is still attracting the masses. North of the pier, if you follow Ocean Avenue you approach Palisades Park. 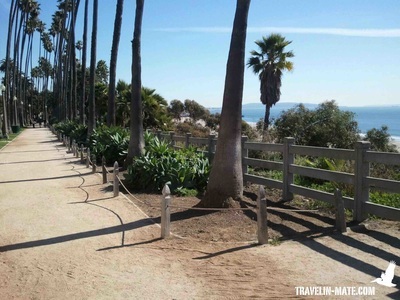 The park is located above the PCH and opens a nice view over the shore and Malibu. In particular during sunset you can expect stunning views over the area. BTW – A couple of miles south of Venice and Marina del Rey are Manhattan and Hermosa Beach. 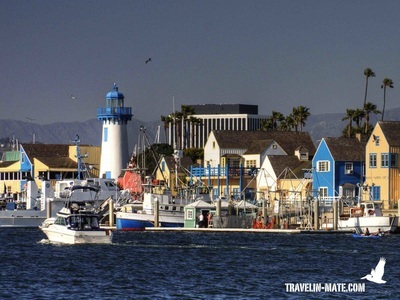 Two quaint beach towns with a promenade that runs parallel to the shore and along beach homes. Some might think it’s worth a visit, but actually you are going to pass plenty of those beach towns on your way down to San Diego. Instead of spending your time here, hold it back for a longer stay in Newport Beach, Laguna Beach and La Jolla/San Diego.